SiteWhere supports integration with the popular openHAB open home automation project. The SiteWhere openHAB plugin (available on the downloads page) allows openHAB data to be stored to SiteWhere as if the openHAB system was a composite device. SiteWhere includes a device specification for an openHAB virtual device, allowing commands to be sent back to openHAB as the result of processing. Begin by installing openHAB as detailed in their getting started guide. Install the runtime, addons, and demo application. Start the system and open the demo application to verify that the installation was successful. # Unique hardware id of device that will receive events. # Device specification token used if device is not already registered. # MQTT broker hostname SiteWhere is listening to. # MQTT broker port SiteWhere is listening to. defaultHardwareId - provides an association between the openHAB instance and a SiteWhere device. Once connected, if no device exists in SiteWhere with the given hardware id, a new openHAB virtual device will be registered under that id. All data sent from the openHAB instance will be recorded under the virtual device. If more than one openHAB instance is connecting to SiteWhere, different hardware ids should be used for each instance. SiteWhere can scale to support thousands or even millions of openHAB instances running concurrently. specificationToken - indicates the device specification to be used if a new device needs to be registered with SiteWhere (if the hardware id does not exist). The default value corresponds to the openHAB Virtual Device specification included with the SiteWhere sample data. This specification includes the device commands used to trigger events on the openHAB bus from SiteWhere. mqttHost - the host name for the MQTT broker SiteWhere is listening to. mqttPort - the port number for the MQTT broker SiteWhere is listening to. Change the port to another value such as 9090. If using the default configuration file provided with SiteWhere, no changes are needed to connect to openHAB. The openHAB addon uses the SiteWhere Java agent to interact with SiteWhere over MQTT. If not using the default SiteWhere configuration, the section below should be copied into the event-sources block. Based on the default data loaded the first time SiteWhere starts, there will be a specification with UUID 5a95f3f2-96f0-47f9-b98d-f5c081d01948 for an openHAB virtual device. Note that the above configuration routes commands for that specification over MQTT as expected by the openHAB addon. 2015-12-02 07:59:35.619 [INFO ] [.s.internal.SiteWhereActivator] - SiteWhere persistence bundle has been started. 2015-12-02 07:59:36.659 [INFO ] [.p.s.i.OpenHabCommandProcessor] - SiteWhere created a new registration for openHAB device. 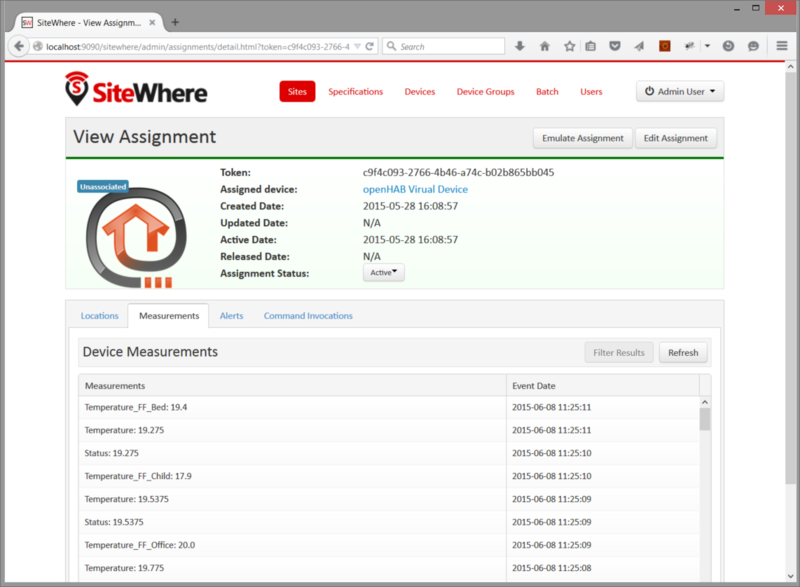 SiteWhere can also send data to openHAB to affect its managed items. For instance, to turn on the light switch in the first floor bathroom ceiling, we can send a command via the SiteWhere administrative interface. From the assignment page for the device, click on the Command Invocations tab. Click the Invoke Command button and leave the dropdown with sendOnOffCommand chosen. Set ItemName to Light_FF_Bath_Ceiling and the command to ON, then click Invoke. An entry will appear in the openHAB log to indicate the light switch state has changed, and the user interface for the demo will reflect the light switch has been turned on. // Get assignment token from event. // Build request for creating a new alert. 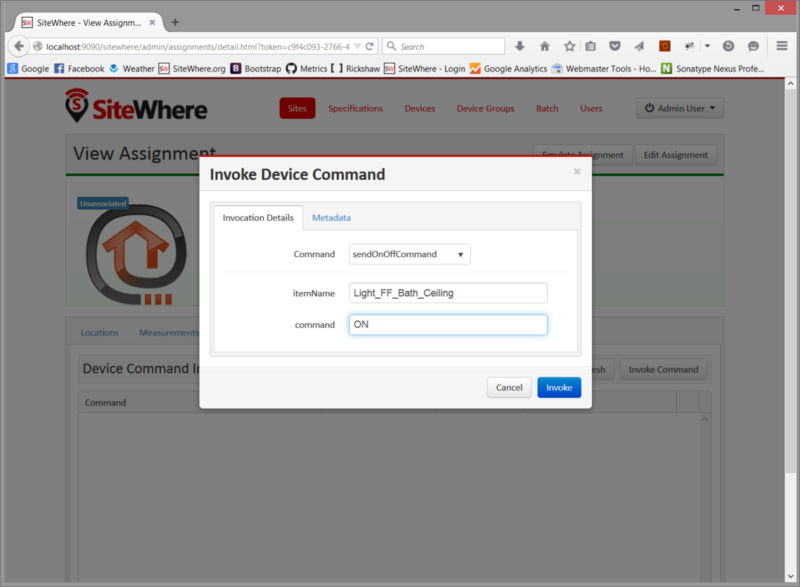 // Create new device alert using device management API. Note the the Groovy script can be changed while the SiteWhere server is running and it will be recompiled on the fly. Bring up the openHAB demo interface and flip the switch in the child’s bedroom off and back to on three times in less than 10 seconds. A system generated alert of type SOS will show up in the alerts list. Now go back to the openHAB interface and flip the switch three times to trigger the event again. Note that SiteWhere sends a command and all of the lights in the home are turned on. Events from openHAB can be indexed in Apache Solr for analytics. Events can be fired into Mule and sent to Salesforce or other cloud providers. Events can trigger SMS messages using SiteWhere/Twilio integration. Events can be fired onto Azure EventHub for CEP and Machine Learning applications. The list above only scratches the surface of what can be done. Play around with combining the building blocks SiteWhere provides and take your IoT applications to the next level!